The Crimean Khanate (Mongolian: Template:Крымын ханлиг (Crimean Tatar/Turkish: Qırım Hanlığı, Къырым Ханлыгъы قرم خانلغى or Qırım Yurtu, Къырым Юрту قرم يورتى; Russian: Крымское ханство, Krymskoje hanstvo; Ukrainian: Кримське ханство Krymśke chanstvo; Polish: Chanat Krymski) was a Turkic vassal state of the Ottoman Empire from 1478 to 1774, the longest-lived of the Turkic khanates that succeeded the empire of the Golden Horde. 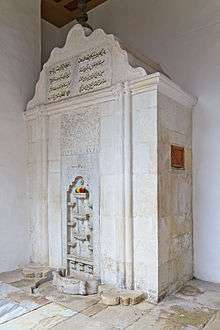 Established by Hacı I Giray in 1449, the Crimean khans were the patrilineal descendants of Toqa Temür, thirteenth son of Jochi and grandson of Genghis Khan through marriage; Temür married one of Genghis Khan's grand daughters. The khanate was located in present-day Russia and Ukraine. 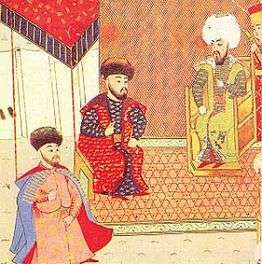 Ottoman forces under Gedik Ahmet Pasha conquered all of the Crimean peninsula and joined it to the khanate in 1475. During the 16th and 17th centuries, the Crimean Khanate was an important center of the slave trade. In 1774, it was released as a nationally independent state, following the Russo-Turkish Treaty of Küçük Kaynarca, and formally annexed by the Russian Empire in 1783, becoming the Taurida Governorate. 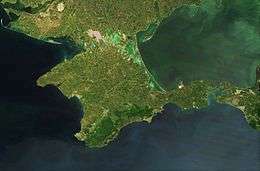 English-speaking writers during the 18th and early 19th centuries often called the territory of the Crimean Khanate and of the Lesser Nogai Horde Little Tartary (or subdivided it as Crim Tartary (also Krim Tartary) and Kuban Tartary). The name "Little Tartary" distinguished the area from (Great) Tartary - those areas of central and northern Asia inhabited by Turkic peoples or Tatars. The Khanate included the Crimean peninsula and the adjacent steppes, mostly corresponding to the parts of South Ukraine between the Dnepr and the Donets (i.e. 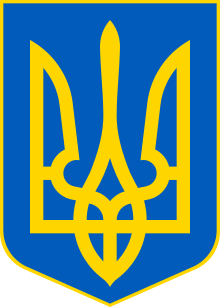 including most of present-day Zaporizhia Oblast, left-Dnepr parts of Kherson Oblast, besides minor parts of southeastern Dnipropetrovsk Oblast and western Donetsk Oblast). The territory controlled by the Crimean Khanate shifted throughout its existence due to the constant incursions by the Cossacks, who had lived along the Don since the disintegration of the Golden Horde in the 15th century. The London-based cartographer Herman Moll in a map of c. 1729 shows "Little Tartary" as including the Crimean peninsula and the steppe between Dnepr and Mius River as far north as the Dnepr bend and the upper Tor River (a tributary of the Donets). The Turkish traveler writer Evliya Çelebi mentions the impact of Cossack raids from Azak upon the territories of the Crimean Khanate, these raids ruined trade routes and severely depopulated many important regions. By the time Evliya Çelebi had arrived almost all the towns he visited were affected by the Cossack raids. 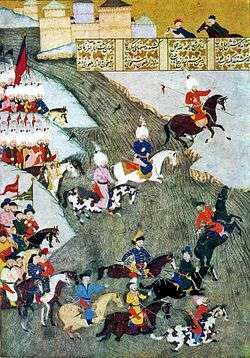 In fact, the only place Evliya Çelebi considered safe from the Cossacks was the Ottoman fortress at Arabat. The decline of the Crimean Khanate was a consequence of the weakening of the Ottoman Empire and a change in the balance of power in Eastern Europe that favoured its neighbours. 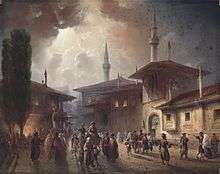 Crimean Tatars often returned from Ottoman campaigns without booty and Ottoman subsidies were less likely for unsuccessful campaigns. 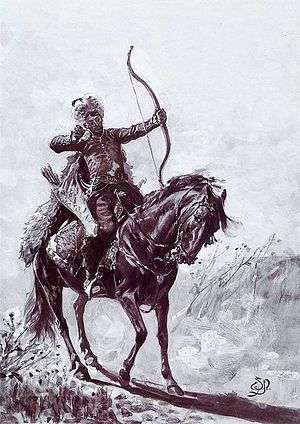 Tatar cavalry, without sufficient guns, suffered great loss against European and Russian armies with modern equipment. By the late 17th century, Muscovite Russia became too strong a power for Crimea to pillage and the Treaty of Karlowitz (1699) outlawed further raids. 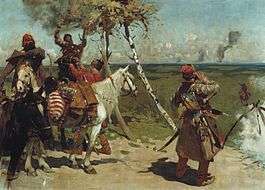 The era of great slave raids in Russia and Ukraine was over, although brigands and Nogay raiders continued their attacks and Russian hatred of the Khanate did not decrease. These polito-economic losses led in turn to erosion of the khan's support among noble clans, and internal conflicts for power ensued. The Nogays, who provided a significant portion of the Crimean military forces, also took back their support from the khans towards the end of the empire. Crimean law was based on Tatar law, Islamic law, and, in limited matters, Ottoman law. The leader of the Muslim establishment was the mufti, who was selected from among the local Muslim clergy. His major duty was neither judicial nor theological, but financial. The mufti’s administration controlled all of the vakif lands and their enormous revenues. 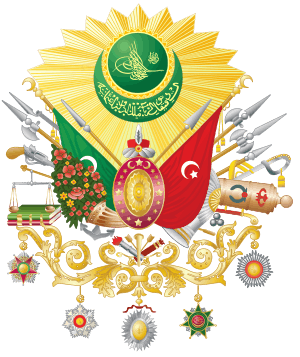 Another Muslim official, appointed not by the clergy but the Ottoman sultan, was the kadıasker, the overseer of the khanate’s judicial districts, each under jurisdiction of a kadi. In theory, kadis answered to the kadiaskers, but in practice they answered to the clan leaders and the khan. The kadis determined the day to day legal behavior of Muslims in the khanate. Substantial non-Muslim minorities, Greeks, Armenians, Crimean Goths, Adyghe (Circassians), Venetians, Genoese, Crimean Karaites and Qırımçaq Jews, lived principally in the cities, mostly in separate districts or suburbs. Under the millet system, they had their own religious and judicial institutions. They were subject to extra taxes in exchange for exemption from military service, living like Crimean Tatars and speaking dialects of Crimean Tatar. Mikhail Kizilov writes: "According to Marcin Broniewski (1578), the Tatars seldom cultivated the soil themselves, with most of their land tilled by the Polish, Ruthenian, Russian, and Walachian (Moldavian) slaves." 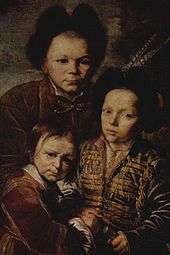 The slave trade (15th-17th century) in captured Ukrainians and Russians was one of the major sources of income of Crimean Tatar and Nogay nobility. In this process, known as harvesting the steppe, raiding parties would go out and capture, and then enslave the local Christian peasants living in the countryside. 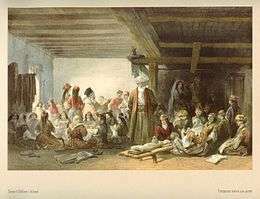 In spite of the dangers, Polish and Russian serfs were attracted to the freedom offered by the empty steppes of Ukraine. The slave raids entered Russian and Cossack folklore and many dumy were written elegising the victims' fates. This contributed to a hatred for the Khanate that transcended political or military concerns. 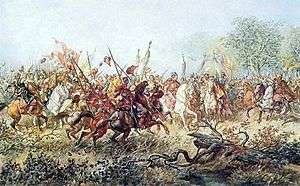 But in fact, there were always small raids committed by both Tatars and Cossacks, in both directions. 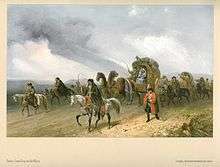 The last recorded major Crimean raid, before those in the Russo-Turkish War (1768–1774) took place during the reign of Peter I (1682–1725). ↑ Edmund Spencer, Travels in Circassia, Krim-Tartary &c: Including a Steam Voyage Down the Danube from Vienna to Constantinople, and Round the Black Sea, Henry Colburn, 1837. ↑ To His Most Serene and August Majesty Peter Alexovitz Absolute Lord of Russia &c. This map of Moscovy, Poland, Little Tartary, and ye Black Sea &c. is most Humbly Dedicated by H. Moll Geographer (raremaps.com). The map shows Little Tartary as reaching the left bank of the Dnepr, and as including the Kalmius but not the Mius, to the north reaching as far as the Tor (Torets) basin, somewhat south of Izium. Other geographers (but not Moll) sometimes included in "Lesser Tartary" the territory of the Lesser Nogai Horde in Kuban, east of the Sea of Azov (in Moll's map labelled separately as Koeban Tartary). 1 2 3 4 Mikhail Kizilov. "Slave Trade in the Early Modern Crimea From the Perspective of Christian, Muslim, and Jewish Sources". Oxford University. ↑ Brian Glyn Williams (2013). "The Sultan's Raiders: The Military Role of the Crimean Tatars in the Ottoman Empire" (PDF). The Jamestown Foundation. p. 27. ↑ Fisher, Alan W (1978). The Crimean Tatars. Studies of Nationalities in the USSR. Hoover Press. ISBN 0-8179-6662-5. Ivanics, Mária (2007). "Enslavement, Slave Labour, and the Treatment of Captives in the Crimean Khanate". In Dávid, Géza; Pál Fodor. Ransom Slavery along the Ottoman Borders (Early Fifteenth-Early Eighteenth Centuries). Leiden: Brill. pp. 193–219.